This International Advanced School addresses the topics at the forefront of scientific research being conducted in the fields of stellar physics and exoplanetary science. It is mainly aimed at PhD and MSc students (although postdocs are also encouraged to apply) in any field of Astrophysics. Students will be given the opportunity to present their own research work by bringing a poster to the School. The School provides an opportunity for the young researchers to network with fellow students and lecturers, thereby promoting awareness of areas outside the main specialization of the student, and potential cross-fertilization of techniques and concepts. The School covers two scientific topics that share many synergies and resources: Asteroseismology and Exoplanets. Therefore, the program aims at building opportunities for cooperation and sharing of methods that will benefit both communities. This cooperation has experienced great success in the context of past space missions such as CoRoT and Kepler. Upcoming photometry and astrometry from space, as well as complementary data from ground-based networks, will continue to foster this cooperation. Observations of bright stars and clusters in the ecliptic plane are being made by the repurposed K2 mission, and NASA's TESS and ESA's CHEOPS missions will soon start obtaining similar data over the entire sky. ESA's PLATO mission will then build upon these successes by providing photometric light curves on a wealth of stars. Ground-based spectroscopy from the Stellar Observations Network Group (SONG) will complement the satellite data for the brightest stars in the sky, as will also be the case with the new generation of high-precision spectrographs being developed for the ESO, like the Echelle SPectrograph for Rocky Exoplanets and Stable Spectroscopic Observations (ESPRESSO). 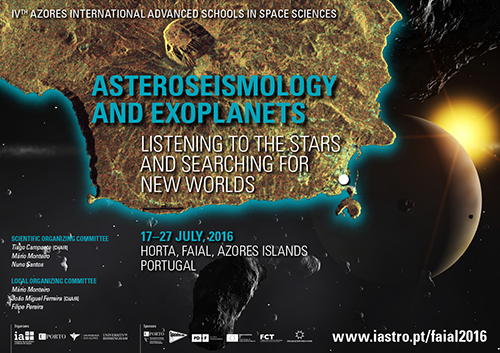 For any questions/inquiries, please contact us at faial2016@iastro.pt.